I first wrote this piece for Novelicious but I love seeing where authors write and I thought you might like to see this so I’m repurposing! Any little peek inside someone’s house that I can get I love – it’s pure nosiness. I like to see the pictures they’ve chosen to hang on their walls, the nicknacks, the flowers, the photographs… it all adds up to the layers of who they are (and whether it fits with who I’ve decided they are in my head!) There’s nothing like peering into the background of an instagram shot and noticing the sofa and the table light! So here’s a view of the space I write at when I’m at home. The table is yellow formica and I found it on the side of the road in pieces. I was too embarrassed to walk down the street with it – v pathetic – but my hubby made me and we stumbled along awkwardly with this broken table between us. But fixed and cleaned up, it’s my lovely yellow desk. I work on a Mac Book Air, which I love although I was seduced by the branding and the sleek silveriness when actually, I’m ashamed to admit, I quite miss Windows and Word. The light I bought at an antique shop and I get immense pleasure when I click it on and off – any distraction I can get! And every time I buy something I really like I have it on my desk for a while, just so I can look at it – like the dog which I got at a car boot this summer. The picture was from a flat that my sister bought, it hadn’t changed since the seventies and there were all these original fashion posters on the wall. If I don’t work here then I work at the kitchen table – where I wrote the whole of The Little Christmas Kitchen. I’m not sure why I decamped but I think it was because of the light – the kitchen gets the sun all day. I let my desk get dusty and set up camp there instead, staring out the window at the leaves and the scaffolders. If I need to get out the house I go to Caffe Nero, but I tend to be distracted listening to other people’s conversations, so then I’ll take myself to The National Theatre where it’s quiet and dark and they serve good coffee. But I usually only last an hour or two before I start to think about how cosy my desk is at home! I quite often write by hand in a notebook – one that’s A4 and lined with no perforation marks so the pages don’t tear out. Initially quite hard to come by, I then found a stash of them at a really old stationers round the corner and bought in bulk for fear that they might go out of business. 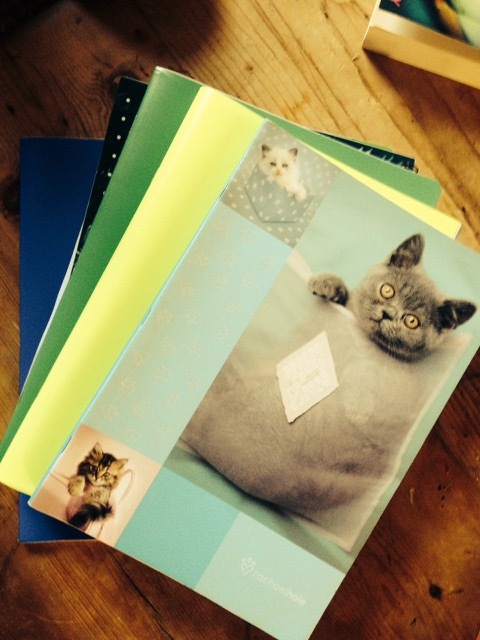 In the photo, the one I wrote The Parisian Christmas Bake Off in is on the top of the pile – you have to forgive the kittens, it was the only one I could find on holiday in Italy. So this is where I work at the moment, and because it’s daffodil season there are usually some on my desk because I think they’re beautiful – the best flowers! I’m sure soon enough I’ll decamp somewhere else and when I do I’ll post another photo. 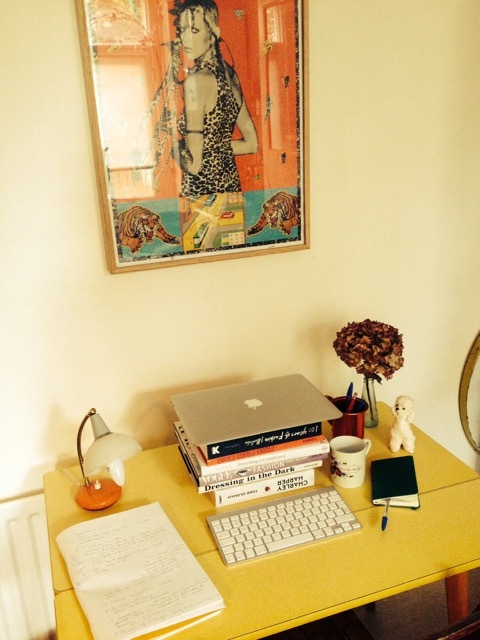 To see other people’s desks, and get your nosiness fix look here: My Writing Room on Novelicious. This entry was posted in Uncategorized and tagged author desk, my writing room, novelicious by jennyoliverbooks. Bookmark the permalink.